Another successful Draggins Car Show at Easter (the 52nd) has come and gone. There were a good number of past members helping out.If you are ever interested in helping out at the show, let the Draggins know, it's always a great weekend and an opportunity to see lots of people you may not have seen for awhile. On the Saturday evening of the car show, all the past members who had been helping at the show, got together at the clubhouse for an impromptu evening of pizza and refreshments. Lots of stories, some good food and fellowship. Doesn't get any better than this! You all have your up to date past members list that we sent out last July, don't be afraid to reach out and phone or email someone that you haven't seen for awhile and join us at next years car show. Let us know of any changes to the list and also send us some up to date info on yourselves so that we can post it here on the Draggins Alumni web page. Our car club would like to recognize the continuing support of one of the alumnus of the Draggins Car Club.. While he may have left an active role in the club many year's ago, he has continued to participate for many years as a judge at our annual car show. He has been an inspiration to other members through his fellowship and example. 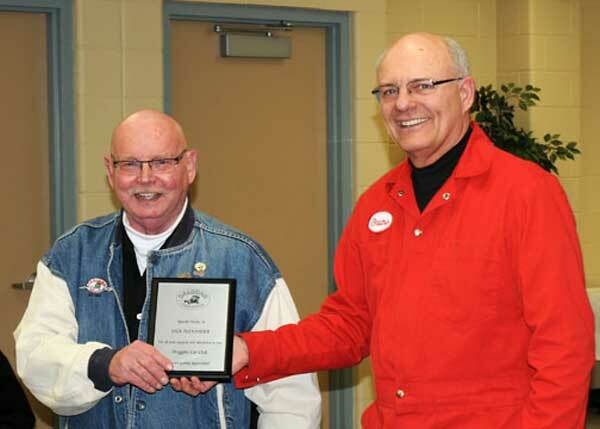 I'm pleased to have the opportunity, on behalf of the Draggins Car Club, to present Jack Alexander this award reflecting our appreciation of his many years of dedication to our club and our car show.